Home » Stock Market » How to be a successful trader in stock market ? Trading in simple language it is to buy or sell goods & services (transferring ownership) in short term duration to earn profit. In terms of stock market buying and selling of shares based on technical analysis or market trend for short term duration for making money is called trading. Difference between investor and trader is investor invest money for longer term and wait for bull run in order to make profit while trader make profit even in bad market condition sounds interesting ! Trader has ability to make more money than investor hence many people try this funda to make more money but fails. Trading is number/mind game. This game is not for faint hearted. In order to become successful trader /in order to trade safely, you must take care of several things. In this article we will describe how to be a successful trader in stock market. Facing problem in Tracking Equity Investment? Manage your Equity with Excel base Powerful Free tool.Click Here Thanks for visiting! This login allows you to real time buy and sell stock virtually without involvement of actual money. This type of trading login provides better understanding of what happens behind the scenes & also boost your confidence level. To become trader is not that easy one cannot become successful trader in day or two it takes few months or years to become successful trader in stock market, hence one must keep approach of learning and gaining maximum knowledge every day. One must read number of books on research, fundamentals, technical analysis, successful traders & technique. You might have heard that “When there is a will there is a way”. One must have strong sprit (will power) to become successful trader. Not only that you must be committed to win, as rightly said by someone “Winner never quits, quitter never win”. Successful trader always make trading strategies as predefined trading strategies always help in managing finance well. Trading strategy must be made in manner to reduce risk and increase probability of profit. Once you set your trading strategies you have to stick to them and must try not to deviate. These strategies will help minimize your trading risks and prevent losses & helps you to reach goal. Following thing must be considered by trader for making trading strategy. (1) Trader must spend good amount of time every day on doing market analysis and maintain log book for next day strategy. (2) Trader must know that at which level he/she should to enter in to stock and at what target he/she will exit from stock. (3) Trader must know what will be his/her move on market trend and reaction against bad news. One has to identify his risk level and stay within that risk level. 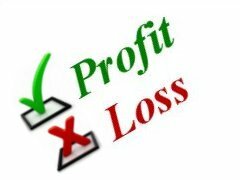 In order to earn profit one must prevent loss. For long term stock may give you profit but for short term one must see that stock will not end up giving loss. Always decide that what will be stop loss for stock and sell that stock on the stop loss. One may adopt strategy not to invest in stocks which are beyond acceptable risk limit. Never trade with emotions & don’t allow your emotions to be involved in your trading activities. Trading with emotion may cause huge losses. Emotion/ gut feeling may be right for some time but may not be correct every time. Always try to analyses situation and does trading. Never allow your heart to involve in process of trading let brain control your trade. Another important point is if somehow you make losses than don’t get nervous from that, but think that failure is opportunity to learn something. Many times you will get important learning lesson from failure only. Successful trader never blames self, market, companies, government or anyone for loss they are making. Market gives enough opportunity to make money trader has to recognize & grab that opportunity to make money. Market passes through various stages some time bullish some time hazy & some time decays it is totally on trader to take advantage of various market stages. If you are new as trader and started trading when market is bullish you may think that market is best place to earn profit and you keep on investing your money, suddenly market turns back and it consume all your profit and sometime erode your capital too. So don’t invest all your money at one shot. Periodically book profit and keep profit separate if possible in another account. This accumulated profit can be useful in bad time or in unfavorable condition. This is to make your life less stressful as you have protection shield of previously earn profit. Trading is like tight rope walking you must balance your condition. Last but very important point is you must consider trading as business, which can make you wealthy. As a successful trader you must review performance every month and find out reason for good or bad performance. Remember that business is done to earn consistent profit. For successful trader making money is more important, it does not matter that how sound you are at technical analysis, you must trigger right trade at right time. If you can’t all analysis and knowledge you have is of no use. If you think this article is useful and you want your friend to be trade successfully in indian market please share this article with them. If you have any query related to trading please post it in comment section. I will be happy to answer it. this is the best ever article that I read. My query is about technical analysis. I want to know how to do basic technical analysis?? Apart from your nice information about our great Indian taxes.you concluded us with your nice joke on taxes is awesome,which helped me to forgot about my taxes that I have paid till now and taxes about to pay..with all ways I am very thankful to you,especially for joke….. Please remove commodity transaction tax from mcx.it I’d very difficult to survive in this market please do something on it. Investing in Stock Market is not the big deal. One must have to open Demat and trading account to start trading in stock market. once you open an account with any of the company you will start getting training and educamp for the trading.